Yesterday I was reminded, via a twitter conversation with the very awesome Joanna Cannon, of an exercise from a Julie Cohen writing course Joanna and I attended years ago. The exercise was simply this: ‘Tell me what your novel is about in one word.’ To which the response is inevitably, ‘Well, er, there’s sort of this woman.. and she meets this… well actually, no, but sort of and then….’ And which point Julie makes her special displeased face and repeats, ‘In one word.’ And the student goes, ‘Errrr…’ which is at least one word, but isn’t terribly descriptive of what the book is about. But it’s a lesson that’s stayed with me. I still try to think about what the book I’m working on is about IN ONE WORD, and I generally manage to work it out. The Christmas Kisses series are all about Identity in one way or another. Sweet Nothing is about Romance, which might sound obvious because it’s a romantic-comedy, but I don’t just mean that the book is a romance; I mean that’s it actually about Romance. It’s about whether romance is the same as love, and whether you can have one without the other, and what romance actually is or should be. Midsummer Dreams is about Fear. It’s about fear of being alone, fear of letting people down, fear of taking a risk, fear of trying to be a better person, and the way that all of those fears can paralyze people and whether/how they can be overcome. And I think that knowing that is really useful. It’s invaluable when you come to edit and revise a book. Knowing what your story’s theme is, gives you a point around which to focus your character arcs and plots and sub-plots. If you have a thread that feels disjointed from the whole you can ask yourself how it relates to that theme, and if it doesn’t, you might well have discovered the source of your problem. But for me, a theme isn’t something that I consciously choose. It’s something that emerges from the process of writing the book. My current novel-in-progress has been my current novel-in-progress for about three years. There are reasons that it’s taken so long, and they are twofold. Firstly, the book isn’t a rom-com, and I’d just started writing it just before I signed my first contract with Choc Lit. Having signed a contract for a rom-com the onus was on me to write something else in the same genre, and so over the three years that this book has been on the go, I’ve also written another full-length novel and three novellas. That’s really bound to slow your progress a little bit. The second reason the novel-in-progress has been in progress for so long was that I did a stupid stupid thing. I decided what it was about (in one word) before I started. And I got it wrong. Cue two and a half years of trying to bend a story to a theme that wasn’t right. When I eventually stepped back and realised, ‘Oh this isn’t about loss. It’s about parenthood’ I also realised that I now knew how to finish the book. I ssuddenly saw the point of a character that my heart was telling me to keep, but had nothing to do with the theme I thought was writing about. I saw how the sub-plots could be strengthened and linked back to my main character’s arc. The novel that’s been about two months off being finished for about a year and a half, might now genuinely be about two months off being finished. And there you go – those are my thoughts on ‘theme.’ It’s definitely helpful to know what yours is, but I think it’s something you discover rather than something you consciously invent. So here endeth the lesson. If you like me wittering about about How To Do Writing then you might be interested in the workshops I have coming up where I will be helping people sort out their novels-in-progress in all manner of interesting and creative ways. That post title is a lie. Writerly things don’t always happen in threes, but this is a post about writerly things and there are three of them, and I’m a creative type and thus prone to exaggeration. Anyhow, ‘what writerly things?’ you cry. Well these writerly things actually. All three of them. Great excitement and joy I tell you. I’m particularly pleased to see this book in the running for an award. I absolutely don’t have favourites amongst my own books. It’s terribly poor form and makes the other books sad, but I have a real soft spot for Cora and Liam, and for Cora’s random bonkers housemates, so it’s lovely to see that other people are loving them too. Cora is shortlisted in the Love Stories Awards Best Short Romance category along side some awesome writers including my RNA buddies Jean Fullerton and Nikki Moore. The awards are presented in London town on November 18th. Yay! Writing is often a rather solitary activity so it was very exciting last week to spend a couple of days staying with my writing chum, Janet Gover, and talking all things writing and book related with a real human being, rather than just shouting plot ideas at the wall on my own. 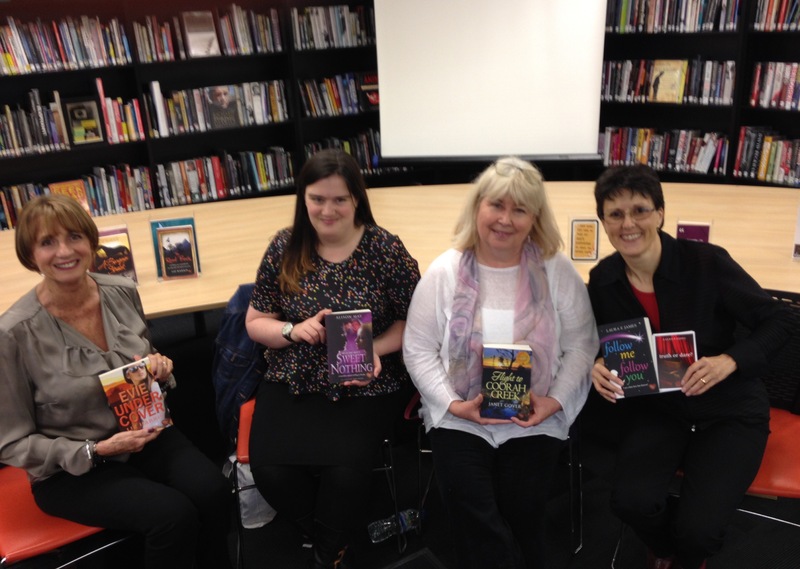 And on Saturday is was trebly exciting to venture even further afield to go and chat about romance writing on a panel of Choc Lit authors at Redbridge Central Library. 3. And finally, Midsummer Dreams news! The paperback edition of my second full length novel, Midsummer Dreams, will be out early next spring. Now, I absolutely don’t have favourites amongst my own books *whistles innocently* It’s terribly poor form and makes the other books sad, but I have a real soft spot for Emily, Helen, Dom and Alex, and for dopey Nick and lovely Theo and Tanya, so it’s rather exciting that non-ereading people are going to get the chance to hold Midsummer Dreams in their hot little hands and get to know all those characters as well. You can pre-order the paperback here. And that’s all my news. Join me next week when I’ll endeavour to find something way more interesting than my own life to witter on about. Yesterday was Awesome Birthday Giveaway Day and now it’s time to announce the winner of a signed copy of Sweet Nothing and lots of other lovely Sweet Nothing and Midsummer Dreams book swag. Add a comment below, telling me which Shakespeare play you’d most like to read a contemporary adaptation of and why? I’ve done Much Ado About Nothing and A Midsummer Night’s Dream. Which play would you like to see as book 3 in the 21st Century Bard series? There were were 25 entries and picking a winner was really hard, so before I announce the winner, here are some honourable mentions for those comments that didn’t quite make it to the top of the podium but made me smile. Gill Stewart made a good bid for glory by suggesting a play that would give me an excuse for a holiday: “The Tempest, it has to be The Tempest. I was first drawn to read the play by Mary Stewart’s brilliant novel This Rough Magic which refers to it constantly. Recently visited Corfu, re-read This Rough Magic and then had to re-read The Tempest too! You can do it Alison – and it would defnitely require a visit to Greece.” Tempting, but not quite a winner I’m afraid. Christine Stovell and Janet Gover had the same suggestion – The Scottish Play, and it’s certainly one of my favourite plays, but not really ideal for a rom com makeover! There were a couple of votes for Measure for Measure, but Callydcfc gets a special mention for having a most excellent reason: “Measure for Measure. It’s got nuns in it. Who doesn’t love a good nun story?” Who indeed? And my final honourable mention goes to Ros Gemmell who came within a hair’s breadth of the prize, and actually suggested the same play as the winner – The Taming of the Shrew. So congratulations Manda! Please contact me with your address and I’ll get your prize in the post to you. Thank you to everyone else who entered. It was a lovely way to celebrate my book (and actual) birthday. Sweet Nothing is out now in ebook and paperback. Would you risk everything for love? Independent, straight-talking Trix Allen wouldn’t. She’s been in love once before and ended up with nothing. Now safely single, Trix is as far away from the saccharine-sweet world of hearts and flowers as it’s possible to be. Ben Messina is the man who broke Trix’s heart. Now he’s successful the only thing rational Ben and free-spirited Trix see eye-to-eye on is the fact that falling in love isn’t part of the plan. But when Ben’s brother sets out to win the heart of Trix’s best friend, romance is very much in the air. Will Trix gamble everything on love and risk ending up with zero once again? Sweet Nothing is a fresh and funny retelling of Shakespeare’s Much Ado About Nothing, set in the present day. And Midsummer Dreams is out now for kindle. Emily is obsessed with ending her father’s new relationship – but is blind to the fact that her own is far from perfect. Dominic has spent so long making other people happy that he’s hardly noticed he’s not happy himself. Helen has loved the same man, unrequitedly, for ten years. Now she may have to face up to the fact that he will never be hers. Alex has always played the field. But when he finally meets a girl he wants to commit to, she is just out of his reach. At a midsummer wedding party, the bonds that tie the four friends together begin to unravel and show them that, sometimes, the sensible choice is not always the right one. A modern retelling of Shakespeare’s Midsummer Night’s Dream. Happy Birthday to Me! Happy Birthday to Me! etc etc. And secondly, Happy Birthday to the paperback edition of Sweet Nothing which is out this week. In honour of these twin excitements I have put together a little present for one of you lovely reading type people out there. 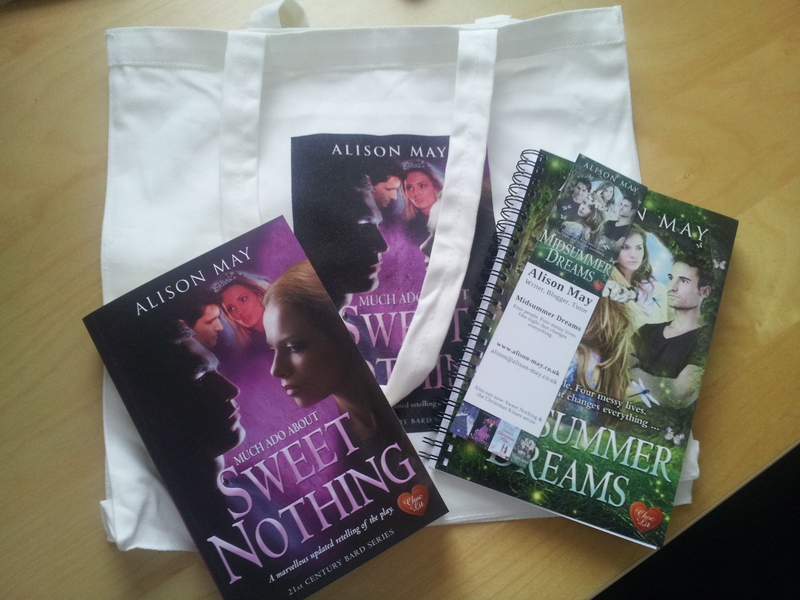 And here it is: We have got a copy of Sweet Nothing (to be signed, of course), a fab tote bag, a Midsummer Dreams notebook and bookmark, and because Sweet Nothing and Midsummer Dreams are both published by Choc Lit, there will almost certainly be some chocolate added to the haul as well. So what do you have to do to be in with a chance of owning all of these lovely things? Well you need to enter a little competition. This is how: Simply add a comment below, telling me which Shakespeare play you’d most like to read a contemporary adaptation of and why? I’ve done Much Ado About Nothing and A Midsummer Night’s Dream. Which play would you like to see as book 3 in the 21st Century Bard series? The best idea and reason, based on my entirely subjective opinion, wins. Here comes the dull bit… this competition is open from 0:01am to 11.59pm BST on August 6th 2015. It’s open to anyone 18 or over with a British or Irish postal address where the prize can be sent. One entry per person. One prize pack available. Winning entry will be selected on Friday 7th August. Good luck! Not actual crime. That would be bad. Being bad is generally considered to be one of the defining characteristics of actual crime, but I am thinking about fictional crime. Yesterday I went to see a panel of frankly awesome crime writers talk at the Worcestershire LitFest. The panel was made up of CL Taylor, Sarah Hilary, Clare Mackintosh and Alex Marwood, all of whom are bestsellers and utterly brilliant writers. A couple of things really stood out – both CL Taylor and Alex Marwood started their writing careers writing books that were marketed as chick lit before turning to crime, and Clare Mackintosh actually turned down a potential offer to publish an earlier book before her astounding breakout debut hit, I Let You Go. All of which made me think a lot about writing and publishing as a career and how easy or difficult it is to switch genres or to write in multiple genres and hmmm… well… thoughts. I’ve been properly snowed under with work recently. I’m marking a lot at the moment, promoting one book, trying to finish writing another and I’ve recently joined the committee of the RNA, which is brilliant but also time-consuming. And then on Saturday afternoon I had an afternoon off. Well not actually ‘off’ – I had an afternoon standing at the front of a class with a flipchart talking about plot and character and trying to help five developing authors get to grips with their own works in progress, and it was immense fun, so much fun that, compared with the days and day of bum-on-seat time I’ve had recently, it almost felt like an afternoon off. Brilliant students, an excellent worked example of a character arc interacting with an external plot (courtesy of Terry Pratchett and Guards! Guards!) and a generally all round lovely afternoon. Midsummer Dreams was published on Friday. You probably didn’t know that. I barely bang on about it at all. The early reviews have been lovely and positive though, which is always a huge relief. Until the first reviews appear there’s always a possibility that nobody else on the planet will understand what on earth you were trying to do with a novel, but fortunately at least some people seem to love this one. Happy dances all around! If you’d like to download a copy for yourself this is the place. I’m currently on attempt 728 to get my weight under control. My current system involves good old fashioned bribery as the incentive, as EngineerBoy has been persuaded to sponsor me £1 for every 1lb I lose. So far I’ve made £4. Yeah baby! Because my current work-in-progress is the third (and possibly final, but never say never) Christmas Kisses book, so for the third year in a row May and June have been soundtracked by White Christmas and Band Aid. No spoilers about the book other than to say it will be Christmassy and there will probably be some kissing. So there you go. There are six things that are on my mind right now. What’s everyone else thinking about? And in celebration of Midsummer Dreams’ first day out there in the wild on people’s kindles, I have begged, cajoled, and blackmailed a whole host of fabulous writers into joining me in what I’m enthusiastically terming a Blog Splurge. It probably ought to have a more official sounding name than that like a Blog Roll or a Blogathon, but splurge is such a pleasing word to say – I’m generally very fond of a word with a ‘pl’ sound in it ‘plonk’, ‘plinth’, ‘pleasure’ – and so that’s what I’m calling it. The idea is simple. I gave all the lovely participants three prompts to get them thinking about dreams and nightmares, and over the course of the day (or next couple of days) they’ll be sharing their own thoughts on their own sites, for your reading and commenting pleasure, and to join me in virtually celebrating release day. I had a dream… last night about Matthew Macfadyen. Specifically about Matthew Macfadyen as Mr Darcy in the 2005 film of Pride and Prejudice, which was unsurprising in many ways because I’d just watched the film, but also a bit weird, because I really don’t like Jane Austen. Sorry. I know I’m supposed to being a romantic novelist and all, but she just doesn’t float my boat. Matthew Macfadyen in breeches though makes for very happy dreams indeed. I had a nightmare… Actually I don’t have nightmares very often. When I do they’re generally of the classic ‘being chased’ or ‘falling’ variety. I used to have nightmares much more often – when I was younger I refused to watch any sort of thriller or crime drama because it would give me bad dreams. If I accidentally caught the start of an episode of Crimewatch I had to stay right to the end so Nick Ross could tell me that serious crime was still very rare and not to have nightmares. Weirdly, that did seem to work – Nick Ross clearly had a very trustworthy face. My dream for the future… is obviously mainly that we will all wear silver onesies and own flying cars and hoverboards. My second dream for the future is all the important world peace and an end to poverty and disease stuff. My final, and if I’m honest currently most pressing, dream for the future is that lots of people – certainly more than seven – will buy the shiny new book. That would be awesome indeed. And if you enjoyed those thoughts about dreams (and even if you didn’t) here’s two fab things you can do next. You can hop over to Amazon and get your own copy of Midsummer Dreams. And then you can take a look at some of the other fantastic dream related blogging that’s going on today. Below (in no particular order) are the people involved. And you can get involved too – contact me on facebook or tweet me @MsAlisonMay with your dreams and nightmares and look out for #MidsummerDreams on twitter for links to all the blogs as they go live. I’m absolutely delighted, pleased, chuffed and gladdened to be able to officially announce that I have a new book out – well not quite ‘out’, technically just ‘available for kindle pre-order‘. It’ll be properly out for kindle (or kindle apps) in June, and hopefully in other formats sometime after that, but still I feel like having an excited author moment, and frankly you can’t stop me. 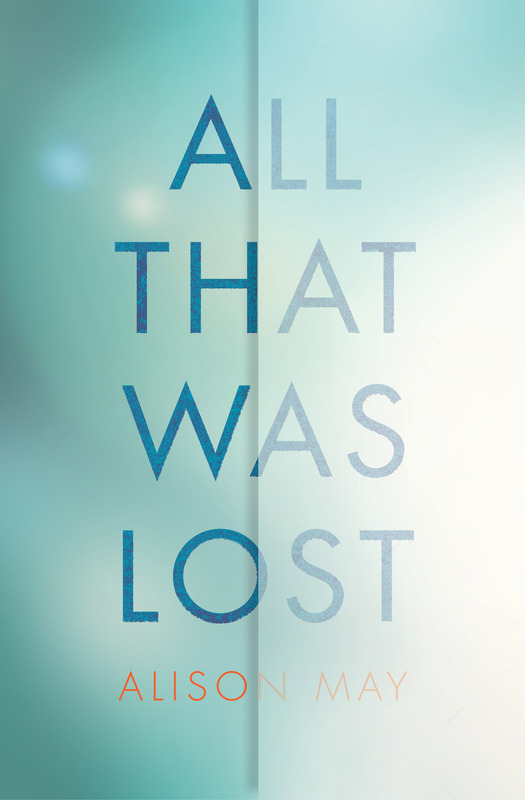 This is my fourth book, and second full length novel, to be published by Choc Lit. 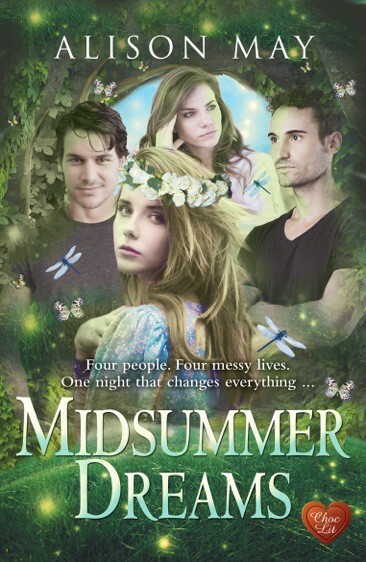 Midsummer Dreams was the first new book I started from scratch after contracting my first one, Sweet Nothing and, in all sorts of ways, it was the classic difficult second novel. I had the idea of ‘a contemporary rom-com inspired by A Midsummer Night’s Dream’ months before I started writing, but translating that idea into words on the page was tougher than anything I’d written before. Suddenly I found myself wracked by doubt. Was the first book a fluke? Could I do it again? What if the publisher thought it was terrible? What if they were right? What if I’d broken too many ‘rules’ of the genre? What if I’d gone too far? Happily the Choc Lit tasting panel, who read all the submissions before they go to an editor, didn’t share my concerns, and so earlier this year I found myself with my nose deep in the manuscript again making edits and revisions to polish the story up into a finished novel. And while I was doing that, somehow, I managed to fall in love with the story and the characters all over again. So here is my lovely new book baby. I hope you will buy, read, enjoy and love these four horribly messed-up people as much as I do. At a midsummer wedding party, the bonds that tie the four friends together begin to unravel and show them that, sometimes, the sensible choice might not always be the right one.